Terroir is a term familiar to wine lovers and recently the term has been used to describe the unique characteristics of food as well. Since soil, topography and climate impact not only grapes and wine and highlight varied characteristics and distinctness, it is reasonable that other crops will be differentiated as well. The concept of terroir goes beyond simple place of origin labelling to include the attributes of a crop or product that makes it distinctive. We believe that #BeefTerroirPEI is a distinctive taste which is present in PEI Beef. Cattle raised on the Island enjoy grass grown on pastures, in iron rich, red soil. They wander freely through the fields of small family farms in refreshing salt-rich air and cool ocean breezes. They are finished with high quality fodder, PEI potatoes and selected feeds. These factors contribute to a distinctive taste for our Premium AAA Prince Edward Island Certified Beef that many chefs believe is a discernible difference. We hope you are able to try our Prince Edward Island Certified Beef and taste the difference of our #BeefTerroirPEI. Our Beef is characterized by its exquisite flavour, tenderness and texture, making it perfect for any meal. Our farmers embrace the essence of the Island and deliver exceptional quality beef for any occasion. Whether you are a good cook, or just want others to think you are, our top tier AAA grade Prince Edward Island Certified Beef is a sure winner. Its supreme marbling sets the stage for a thoroughly delicious experience. You care about your health. So do we. Because our Prince Edward Island Certified Beef measures up to strict standards of raising, handling and processing, you will feel great about serving it to family and friends. Prince Edward Island cattle maintain a peaceful, pastoral rural lifestyle, free to eat greens, be active and enjoy the brisk salt air. That’s why Prince Edward Island Certified Beef is in a distinct class of its own. From our farm families to your hungry brood, exceptional quality beef is an important part of Prince Edward Island pride and heritage – and we safeguard it very carefully. Your family’s health is important to you. Their health is important to us, too. 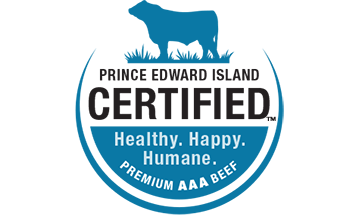 In fact, our producers are very cognizant of their responsibility in making sure Prince Edward Island Certified Beef is safe. 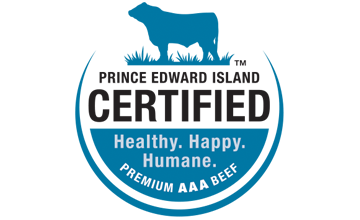 That’s why, in keeping with their natural lifestyle, Prince Edward Island Certified Beef cattle are raised without the use of added hormone or hormone implants. Keeping animals healthy is a top priority for farmers. While providing care to sick cattle is the humane thing to do, use of antibiotics is kept to a minimum and never administered within the last 100 days before processing. All antibiotics used with farm animals must meet Health Canada’s strict standards for human and animal safety. Traceability of our cattle from farm of origin onward is vital to ensuring proper food safety practice, the welfare of our animals and the protecting quality of our food. All Prince Edward Island Certified Beef are fully traceable. Prince Edward Island Certified Beef Producers are committed to quality and flavour resulting in a premium product. All cattle are finished on Prince Edward Island small family farms. A truly local brand. Fair trade – Each head of cattle sold ensures money goes to support PEI feedlots and cow calf producers. A brand that is owned collectively amongst the growers and Atlantic Beef Products. Cattle are raised without using growth hormones. Cattle are never treated with antibiotics within 100 days of slaughter. All farmers who raise cattle for Prince Edward Island Certified Beef have completed humane handling courses. Processed exclusively by Atlantic Beef Products. All animals are under 30 months age verified and traceable to farm of birth.